Eye tracking was used in this preliminary research study by Kennesaw State University to investigate student gaze patterns during physical science lectures. It discovered that classroom attention is impacted by various factors throughout the duration of the lecture. A fundamental keystone in education research is to help students learn, whether the research involves labs, problem solving, tools for learning or lectures. Eye trackers can aid in this endeavor by providing an additional piece of data with which researchers can better understand students and the impact of what professors do with the students during lectures. This preliminary research study by Kennesaw State University Associate Professor of Physics Education David Rosengrant demonstrates how eye tracking can be used to investigate students' attention in lectures. We were able to measure what the students observe during a lecture, how much of their time is dedicated to the material presented in class and, as an instructor, what are the greatest inhibitors to keeping their attention. What do students focus on during a lecture? What will divert the attention of a student away from being on task? What keeps a student on task during a lecture? Eight students, all attending a basic physical science course for pre-service elementary school teachers at Kennesaw State University (KSU), participated in the study. 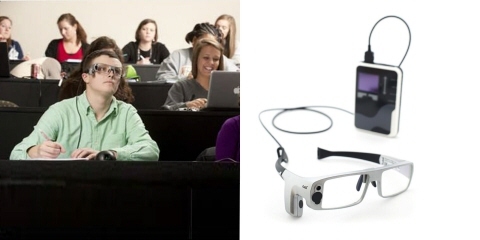 Each subject wore the Tobii Glasses for the entire lecture. By eliminating the need for subjects to focus on a computer screen or carry around a backpack-sized recording device, the mobile eye tracking solution enabled researchers to study the broader range of research questions. The eye tracker recorded data for 70 minutes, combining audio and video with a dot representing where students were focusing. This image is a screenshot of output data from the eye tracker showing the instructor going over the answers to an in-class quiz while the subject looks at the diagram. This gaze replay clip shows the eye movements of one of the students, who participated in the study. The subjects did not receive any benefits for participating in the study. Because only a limited number of students volunteered for the experiment, the ability to make certain comparisons was restricted. One of the most interesting findings in the study was, regardless of all factors, that the students spent little time focusing on the actual professor. Students read the PowerPoint slides or looked at their notes instead. There were noticeable exceptions. When the professor became very animated, drew something on the board, injected humor or used analogies not in the PowerPoint slides, the students tended to watch him. Students also focused on the professor when he went over the answers to the weekly quizzes. Lastly, student question and answer sessions yielded polar opposite results. Most of the distracters for the students were not surprising. Texting or surfing the Web (typically Facebook) was the biggest distracter even though this behavior is discouraged during a lecture. Other students in the class were also distracters. Distracters are sometimes related to the location of the students in the classroom. Researchers were not able to discern any type of clear pattern as to how long into a lecture the subjects typically go off-task. Rather, when do subjects lose interest in the class? Though more analysis needs to be done, the preliminary results suggest findings that both reinforce and challenge previously held beliefs about lectures. The first challenge is the notion that students only absorb information in set blocks of the lecture, usually the beginning and the end of the lecture. Though researchers reported in their findings that students started to get off-task at certain points in time or were off-task frequently, a student was never completely off-task for any considerable length of time (more than 3 minutes) throughout the lecture. Findings support the idea that student location in a classroom may impact student performance. Researchers noticed that students in the front and the middle of the classroom tended to be on-task more than students on the extreme sides of the classroom because those students in the back of the room have more visual distractors. More data needs to be collected to determine how strong the correlation is between the length of time a student's gaze pattern suggests that they are on-task with their performance in the classroom. Data can also be interpreted in different ways in regards to how to enhance a lecture. I used Tobii Pro Glasses for their portability and ease of use. The glasses were not greatly distracting to the students so that allowed for more genuine data as to how they normally pay attention to the classroom.